A few years ago, a cousin sent me a photo that showed her Lounibos relative in front of his liquor business with a man named Antoine Lassalle. It was taken around 1900 in San Francisco, California. He was thought to be a cousin, but the connection was not clear. I had no Antoines in my Lassalle tree and neither did she. I put the photo aside since I had other genealogy trails to follow. Not long ago, I found that photo on my computer. His identity nagged at me. I had done quite a bit of research on the Lassalle line and I was no closer to figuring out his connection. Who was Antoine Lassalle? What was his connection to our family? Many databases have become available for San Francisco and France in the years since this photo fell into my hands. Solving this mystery proved to be much easier than I anticipated. I found possible entries for Antoine in the 1900 and 1910 U.S. Federal Censuses. In both cases he was a lodger with no connections to those he was living with. 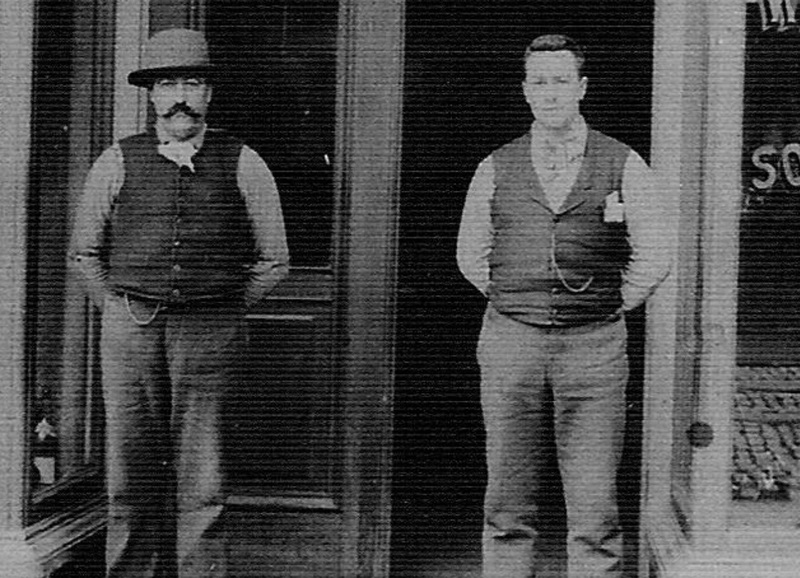 In 1900, Antoine was listed as a cellarman for JB Lounibos Liquors. This was my guy! The address matched the 1900 census. I know had an idea of where he lived, where he worked, and clues to his year of birth, year of immigration, and the fact that he was divorced. My next stop was the California Digital Newspaper Collection. I did several searches with various spellings of his name and found his divorce from a woman names Jeanne. A search for Antoine Lassalle on Ancestry.com proved frustrating. I had trouble finding the original census records I had located earlier let another new documents. I had to assume that there was an error in his name in the index. I decided to check the San Francisco Genealogy website to see if I’d have better luck. They have the San Francisco mortuary database. I was pleasantly surprised to see more mortuaries added to the collection. I found Antoine’s record and it is the key unraveling his identify. The record itself was unremarkable. The informant was the French fraternal organization, Ligue Henri IV. The obituary, on the other hand, gave me a lead. He was noted as the uncle of Henrietta (Chauvet) Meller, someone I had connected to my family tree only a couple of days earlier. She was a descendant of Marie Lassalle-Maiste who was my ancestor’s sister. If the obituary was right, my mystery man was related to Marie. 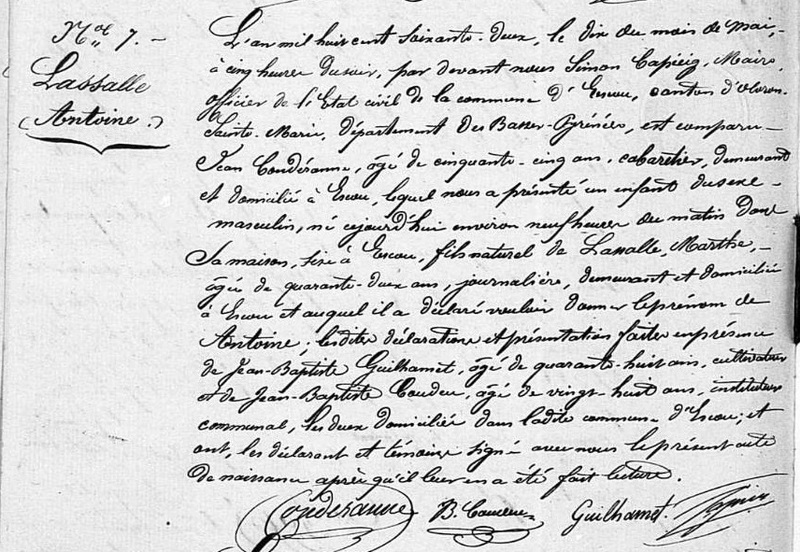 A tip from my French cousin, Jean, made the search for Antoine’s birth record much easier. I was directed to an index for the region. From the census, I learned Antoine was born ca. 1862. That’s where I would start. I expected him to be born in Ogeu les bains where my grandfather’s family lived. There were no matches for the years I wanted. I then looked at Escou where the Lassalle family originated. I didn’t expect to find anything because I thought the family had left Escou by this point. My assumptions were wrong. There was one group of Lassalles living in Escou and Antoine was one of them. His birth record told me all I needed to know. What is Antoine Lassalle’s Relationship to my Family Tree? Antoine was born 10 May 1862. His mother was Marthe Lassalle. No father was given. I knew exactly who Marthe was. She was the daughter of Augustin Lassalle and Marie-Anne Maisounave, my 3rd great grandparents. So, what was Antoine’s connection to J.B. Lounibos and the Lounibos family? Antoine was Jean Baptiste (J.B.) Lounibos’ uncle. Jean Baptiste’s parents were Marie Lassalle-Maiste married Jean Pierre Lounibos who brought their family to America sometime around 1873. Marie was Antoine’s sister. Marthe Lassalle was my ancestor’s sister. That means Antoine was the nephew of Jean Lassalle and Marie-Anne Alexine Loustaunau, my 2nd great grandparents. Antoine Lassalle d. Jeanne ??? Besides the familial connections, I learned that Antoine had diabetes. He died from complications of the disease. This caught my eye because the Lassalle side seems to be rife with diabetes. Off the top of my head I can name 10 family members in the last two generations either diagnosed with diabetes or who are pre-diabetic. The death records leave no clues to whether Antoine had offspring. It’s difficult to read too much into the obituary since only one niece was listed and their were many relatives alive at the time of his death. Perhaps his niece was listed in his Ligue Henry IV records but no one else was. My next search will be to find his ex-wife, Jeanne, to see what happened to her. She could have easily taken any children and moved elsewhere. She may have even returned to France. As always, I am fascinated, watching you maneuver these trails. How lucky you read French! I can’t read too far back in some of my lines because I haven’t the languages, or not enough to make sense of them. Once again, you inspire me to see what threads I might unravel today. Thank you. My father is John Baptiste Lounibos (born 1903) His father was Jean Baptiste Lounibos (born 1873). Marie’s mother, Marthe Lassalle. However, my cousin (Joan) had information on Augustin Lassalle. Thank you also for the new information on Augustin’s wife, Marie-Anne Maisounave. Anna, So nice to meet you! Thank you for letting me know how you fit into the family. I have worked with Joan in the past, but haven’t been in contact for awhile. Before we got in touch, I had not heard of the Lounibos or Lassalle-Maiste side of the family. It was interesting to follow this trail and find that Antoine Lassalle also belonged to Marthe Lassalle.